The last time I saw a film by Alain Resnais, I was scarred for life. In fact, I watched Night and Fog a whole year ago and every time I think of it, my skin crawls. So I was a little weary about Hiroshima Mon Amour, one of the earliest New Wave films, but thankfully there was little scarring on this movie's part. Instead, this is a film about a French actress (Emmanuelle Riva, who is currently gracing screens in Michael Haneke's acclaimed Amour) and a married Japanese architect (Eiji Okada) who have an affair, but no that they'll have to part ways in a very short amount of time. The film is basically a compilation of the conversations they have over the 36 hours that they are together, which are mostly based around the idea of the limits of memory. While I am a self-confessed fan of hearing people talk, this film, for some reason or another, frustrated me. I'm not sure why that was, as the words said were beautiful - I guess it was either the fact that I was exhausted or I just couldn't really connect to what was going on. Aside from that, it was beautifully made (which I think is just a given because all New Wave films have such brilliant ways of expressing themselves). Also, the opening was great - even though it is different from Night and Fog, I could see how Resnais was building on what he'd done there with a mix of clips revolving around the terrible events of Hiroshima. Certainly something that I wasn't expecting, but Resnais does that sort of thing well. François Truffaut began my New Wave series with The 400 Blows - which coincidentally began that New Wave itself - and he is the one to end it with Jules and Jim. Even though the films are extremely different, I can definitely see a clear Truffaut connection in the way that they are made. The strange, often erratic editing is probably the one thing that stuck out for me. Editing is one thing I really like, if it is done in the right way and isn't too distracting. Truffaut seems to hit the nail on the head with that one. While Truffaut started the French New Wave with a dark, depressing drama about a boy's tough life, Jules and Jim takes a lighter route, before eventually turning into sadness - which is what most New Wave films do, I've found. It follows two friends, an Austrian writer Jules (Oskar Werner) and French Jim (Henri Serre) who meet the impulsive Catherine (Jeanne Moreau). Now, I've seen my fair share of love triangles played out on film before, but none like this one. While fairly entertaining, I admit to being a little frustrated by Catherine and how the men seemed to be hanging off her. I'd be running away from someone like that - but I guess she does have her charms. However, the way this film bases itself around the Great War is something that brings true heartbreak to the film, even though I felt that it was a shade undercooked. There wasn't a hell of a lot for me to grab onto in this movie, but it was still well and truly worth the watch, particularly if anyone wants to see what a true example of a French New Wave film is. Anyway, what did I think of my experience with French New Wave as a whole? It was definitely an interesting experience - especially because I saw where cinema sort of, I don't know, changed, and where the influences for some of the films I see today came from. Mind you, I can't say it was the most fun I've ever had. I honestly can't think of one film that didn't leave me on a bummer note. However, that's just fine. I've decided that I like films to depress me more than I like them to make me happy. Yes, I'm strange. What am I going to dip my toes in next? Next month will be dedicated to anime films. Don't worry about recommendations just yet, I have two all set up for next week and will put up the call then. As of now, though, what do you think of Hiroshima Mon Amour or Jules and Jim, and my coverage of the basics of French New Wave? It was cool. You were much more spread out than me, when I did this. I actually really liked both Jules et Jim and Hiroshima Mon Amour. The first because I love a character like Catherine, and the second because I just liked the concept of it. And I am also one of those saps who loves long amorous talks, idk. I tried to pick from lots of trees, but eight spots wasn't enough! I thought you'd like Jules and Jim more than you did, but never mind. Shame you didn't get to see Day for Night. I don't remember Hiroshima mon Amour as clearly as I do other Resnais films (particularly the unforgettable, visually incredible Last Year at Marienbad), but I owe it another viewing. All in all, I'm pretty happy with what you've seen anyway. It's a pretty decent start, and though some of the films didn't really click with you (don't worry I honestly did feel the exact same way when I started watching them), I'm glad you at least gave them a try. That's all I can really ask, is that you give them a try, and you have, which is awesome. Nice work! It is a shame I didn't get to see Day for Night. I started watching it on YouTube but one video was missing which was annoying. I can't get it off Fatso so...ugh. I'm actually really annoyed that Criterion haven't released it. They're so enthusiastic about Truffaut and they've released all his best films except for that one. Hopefully in the future they'll pull their heads in and realize what a classic is missing from their collection. Hopefully that does happen, because I really want to see it! You did the coverage pretty darn well! I've wanted to see all these films for a while, so maybe I'll try to finally watch them. It's disappointing that Jules et Jim and Hiroshima Mon Amour didn't blow you away, but since I haven't seen them, I can't agree or disagree. Anyway, I'm really really excited about your upcoming anime blogathon! Definitely check out some of them. I think you'd enjoy The Umbrellas of Cherbourg! 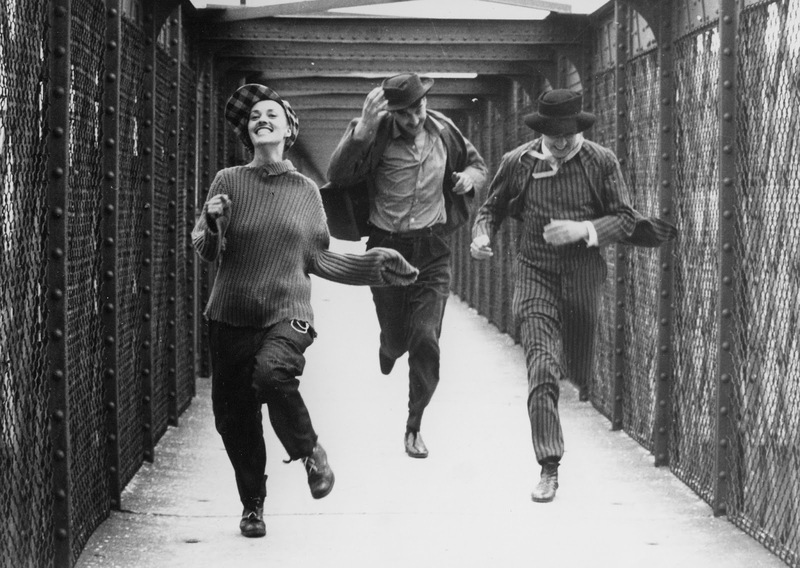 Jules and Jim is one of my favorites, mostly because Jeanne Moreau is so incredible, and also as you said, because the film captures the full spirit of what we know as the New Wave. I do agree that Hiroshima is not as wonderfully enjoyable as the rest, and doesn't stand the test of time as well as the others in your list. That was a controversial relationship when it was made, but not so much today. It is mostly important for it's experimental style, especially those quick flashbacks. A technique that was never used before. I have to say I very much enjoyed your French New Wave coverage, very happy that you've discovered these films for the first time, and hope that you decide to explore more of them in the future. I will definitely explore more of them in the future. Eight films wasn't enough at all! 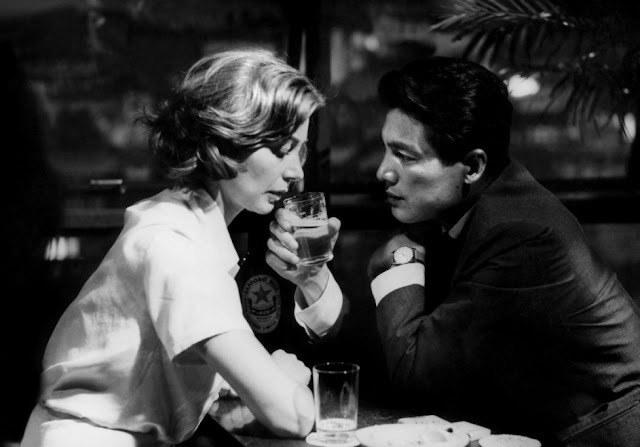 Surprised that you didn't like Hiroshima Mon Amour, thought that would be a sure bet for you! Hoping that you have Akira in that list of films you're gonna watch for next month! Eh, I thought I was going to like it a bit more but unfortunately that wasn't the case! Looking forward to your Anime films list. I consider myself to be a pro in that particular arena. A look. Thanks for your write-up. The anime one shall be quite fun! Definitely give those two a look - they're really good. Haven't seen Hiroshima mon Amour yet but I saw Jules and Jim this month and it kinda frustrated me as well. I literally had no idea why would Jim keep on going back to her especially in the end, where he has someone else in his life but otherwise it was really good and I like what you said, it is true example of French film. I am trying to see as many 60s foreign movies from 1001 movies list. I added couple of movies in my watchlist after your review, so I shall call it a success !! I am a big ghibli fan myself, even more than Pixar. So, I will be waiting for your Anime month !! I'm glad that someone else felt the same about Jules and Jim as I did! Have fun with whatever you chose to watch! Good series, interesting range of choices. I don't recall liking Jules & Jim that much myself, though I am a big admirer of Hiroshima mon amour. Give the latter another go sometime, probably not the best film to watch when tired. I don't think it's nearly as formidable as it was considered to be when it first came out, but it's still not necessarily an easy film per se. I love Last Year at Marienbad but it's a lot more difficult going even now. And despite my own oft-voiced reservations about Godard, I have at least decided to take the plunge with Vivre sa vie, which I bought at JB Hifi today (they were having a 20% off sale, which helped convince me). I'll definitely rewatch Hiroshima Mon Amour in the future when I'm more awake! Oh, the JB HiFi 20% off sales are the best! Seriously, that took away all of my money when I was in Melbourne. I'm not quite sure what it was about the film that you didn't connect with, but I would say you should definitely check out Hiroshima Mon Amour again at some point. Also, you might as well check out Resnais next film, Last Year at Marienbad, to watch one of cinema's most perplexing films.